Looking for ideas for NanoDays 2012? I'll be highlighting some examples of NanoDays activities from the 2011 NanoDays reports in the NISE Net blog over the next few weeks. I encourage you to get in touch with the partners listed to learn more about their work, or to contact your regional hub leader for additional ideas and support. 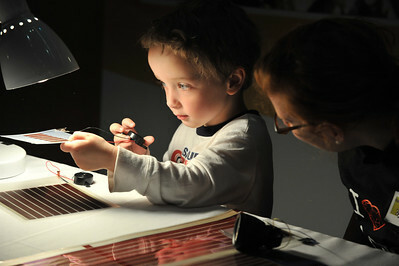 A visitor explores solar panels made by local industry partner Konarka at the Museum of Science 2010 NanoDays. Photo by Josh Reynolds. "At the Museum of Science, Boston NanoDays event, we've tried to show that nanotechnology isn't just limited to research labs, but that some applications are already developed and affecting our lives right now. So, to supplement the hands-on activities from the NanoDays kit and our guest researcher presentations, we've added the 'Nanotech in Our Lives' activities to let visitors explore nanotech-enhanced products, and learn about the science that makes them work. We've invited local nanotech companies to showcase their technologies with hands-on activities for our visitors - examples include quantum-dot lighting and displays; a nanotech-enhanced water filter; thin film solar cells; and carbon nanotube wiring and material composites. These industry partners are eager to help (and appreciate the PR for their products), and visitors have commented that they enjoyed seeing the real-world applications of nanoscale science and engineering." Have you involved local industry partners in your NanoDays events? Leave a comment or shoot me an email at volney@mos.org.